The American Green Tree Frog is a beautiful species of New World tree frog that is common throughout the American south. These frogs also make great pets and are equally interesting to observe and study. They are monotypic meaning that do not have any sub-species. Green tree frogs are a beautiful species of frogs. The males are usually slightly smaller as compared to the females. Moreover, the wrinkled throat (an indication of the vocal pouch) is a feature that is common only among the males. 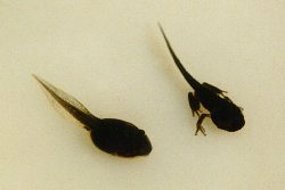 Size: These medium-sized frogs roughly around 6 centimeters (2.5 inches) length wise. Color: The green shade of their body may vary from a startling bright yellow olive to a distinct lime green. It is important to remember that the temperature or lighting largely affects the darkness or tone of the color change. One can also notice miniature gold or white patches on the frog’s skin. The pale yellow or creamy white line that runs down from its jaw right up to its groin is also a distinct feature. The area of the abdomen is generally pale yellow or white in color. Toe Pads: Characteristic to most tree frogs, the green tree frog also has large toe pads. These frogs mostly dwell in habitats with plenty of floating vegetation, debris, grasses and cattails. One may often spot them in large lakes, marshes, small ponds and streams. Green tree frogs are native to Southeastern USA with populations chiefly concentrated and ranging from Eastern Virginia and Southeast Florida in the East and central Texas right up to the west. These species are also noted in Delaware and Maryland. 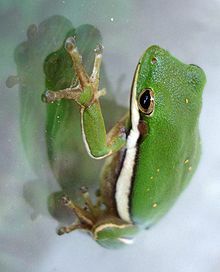 Green tree frogs are also found in areas up and around the Vancouver Island and some areas of British Columbia as well. The green tree frogs love to feed on insects of all kinds. As such their diet comprises of mosquitoes, flies, and smaller insects. It is also very interesting to note that these frogs have a huge preference for the kind of prey that is highly active; the prey size does not come into account. 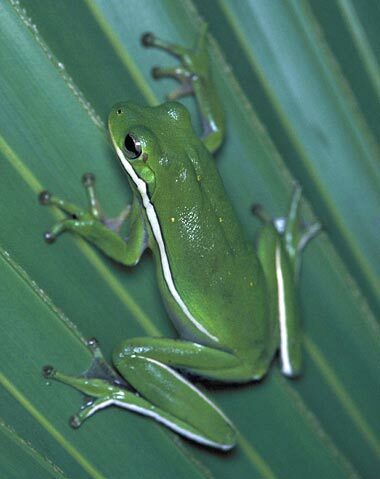 The call of the male green tree frog can be usually heard on humid, overcast nights. Its call comprises of a series of “quonks” or “queenk-queenk-queenks” sounds. The peak breeding season of the American Green Tree frogs lasts from April to August. Males produce a distinct and particular advertisement call to attract their mates. The actual act of mating involves amplexus whereby the male grasps the female from the back; the males release their sperms that swim across to the female eggs, allowing the process of fertilization to occur. It has been observed that males are polygynous; they do not stick to a particular partner and rather tend to mate with as many female mates as they can attract. Breeding is known to be highly dependent on the day length, temperature and precipitation. The female frog lays up to 400 eggs in a single clutch. Green tree frog tadpoles hatch out of the eggs within a time period of 4 to 14 days. 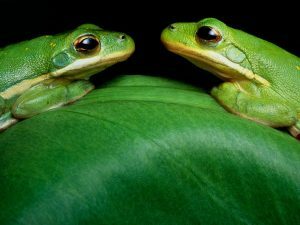 It is not unusual for the American green tree frogs to have multiple clutches in one mating season, despite of the fact that they breed only once in every year. Let us take a look at some facts about the green tree frog. 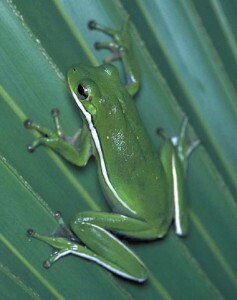 The American Green Tree Frog is recognized to be the state amphibian of Georgia and Louisiana. These frogs seem to prefer a kind of a challenge in their way of preying. It is interesting to note how ninety percent of the times they eat the active ones rather than the slow ones who pass them by! The popularity of the Green Tree Frog as pets has been noteworthy. As a matter of fact some have lasted for over 6 years in captivity! Green tree frogs make great pets. These frogs, apart from being cute and small are also incredibly easy to care for. If you are planning to get one, the following instructions can be very handy for you as well as your new pet friend. Tank: A minimum of 10 gallon tank or terrarium will be ideal for your little friend. It is necessary to make sure that you get a tall tank for the frog. It is the height of the tank that is more important than the floor space. Of course, the tank cover is something you cannot afford to miss since you do not want your new pet friends to go missing! Substrate: It is recommended to use a substrate that will be able to hold some humidity. As such, a substrate made of gravel, cypress mulch or even soil with a decent quantity of peat/vermiculite will do great. The substrate can also be covered with moss and cork bar. Artificial environment: Lastly you have to make sure that you create an environment for the frogs like the ones they are accustomed to in the wild. In order to do so, you will have to place small branches, leaves and even artificial plants in the terrarium for the frog to climb. You also be very careful about the fact that the wood collected is pesticide free since that could be harmful for your pet. Temperature: During summers, a gradient from 20-25 Degree Celsius (68-77 Degrees Fahrenheit) is considered to be suitable. In the winter months a much cooler temperature gradient is to be used. Light: A UVA/UVB light is not necessarily required in the terrarium since your new pet friend is nocturnal. Water: A large and shallow water dish filled with de-chlorinated water is essential for the frog. Do not forget to mist the cage with the same type of water on daily basis so as to maintain the humidity level inside the tank or cage. Diet: Your new pet friends will eat crickets, moths, flies and worms. Make it a point to occasionally provide them with some vitamin supplements as well. Green Tree Frogs have an average life span of about 2 to 5 years. 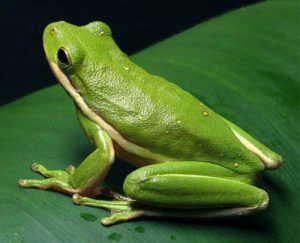 The green tree frog is not an endangered species; as such it is enlisted as a species of Least Concern on the IUCN list. Here is your chance to take a look at some great pictures of the Green Tree Frog. I just took a picture of a green frog on my porch hoe do I send it to you. I noticed a green tree frog on a hosta leaf yesterday. The temp dropped to 38 by this morning here in NW Iowa. As the sun has been on the hosta during the morning, the temp has increased to 60. The frog is still there although he has moved to a higher part of the same leaf. Don’t want them in my apartment; please help!!!!!!!!!!! !